First of all, don't panic!! They won't hurt you, your children, or any of the other animals you have your home. There are different types of mites found on and around hermit crabs. Some are completely harmless, while others live on the crab and should be removed. Each species of mite makes a meal of something different, so it's important to know what you're dealing with. Mites tend to make people very uncomfortable or gross them out, but mites are extremely common! We just never notice them until they swarm on something. Before you rush off to clean everything, please take a moment to learn what they might actually be. Also known as grain mites and wood mites. These types of mites are what you find on food, substrate and other organic matter in your tank. They are native to our environments and homes, and are attracted to the hermit crab enclosure due to the heat, moisture, and food supply. Because of this, cleaning the tank will often have little effect on keeping them from coming back. They do not pose a threat to the hermit crabs, and will aid in breaking down organic matter and waste located inside the tank. They are white, cream, or gray in color, and are fairly slow moving. They normally resemble little shiny plump grains of sand. Most crabbers notice them for the first time when they drown in large numbers in the water dishes, or when they swarm a piece of forgotten food. They will also feed on hermit crabs who have passed away for other reasons. If you do want to attempt to rid your tank of them, you will need to remove the hermits to another location for a day while you work on sterilizing their main home. Remove everything from the enclosure and either bake or boil everything that is safe to do so. The rest of the items that are not heat-safe should be bleached to kill any mites that might be hiding on them. All substrate and moss should either be boiled, baked or replaced. (If baking substrate or wood, make sure that the temperatures in the middle of the pan or log get hot enough to kill any mites that might be insulated in there.) The tank should be soaked in bleach water up and over the rim to kill any mites that might be tucked away in there. The tank and all items that have been bleached should be rinsed extremely well with running tap water until there is no odor left, and then rinsed a final time with dechlorinated water. You should also clean the area where the tank sits thoroughly before setting it back up. However, even with this thorough cleaning there is no guarantee that the mites will stay gone for very long - some members have reported reinfestation within 3 to 7 days! You can also attempt to control their numbers naturally by introducing a predator (see "Mesostigmata" section below), competition (terrestrial isopods), or daily spot cleaning (removing organic debris). Isopods seem to be the most effective in controlling food mite populations. The rapidly out-compete the food mites for food, and will even eat the mites themselves. However, in this method of control, you will basically be swapping food mites for another small (but cute!) creature, so make sure you are ok with this. In addition, daily spot cleaning will help remove food sources of the mites. Also known as soil or moss mites. 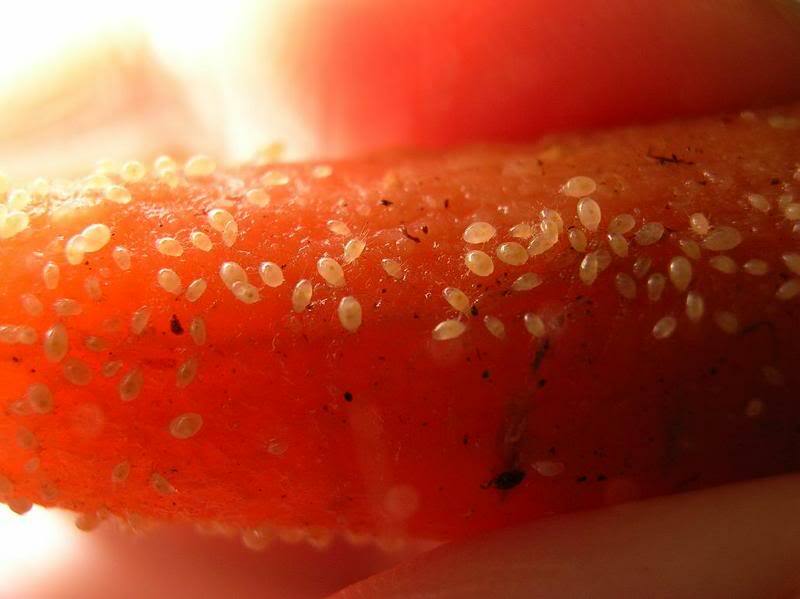 These are harmless mites that eat decaying plant material, which includes cocofiber, moss, and fruits and veggies. Because of their small size and dark coloration, they are almost never seen unless they drown in the water dish in large numbers. An order of mites that have long legs (often mistaken for antennae) and wander around eating other even smaller critters (nematodes, springtails, and other mites) that can be found in hermit crab enclosures. 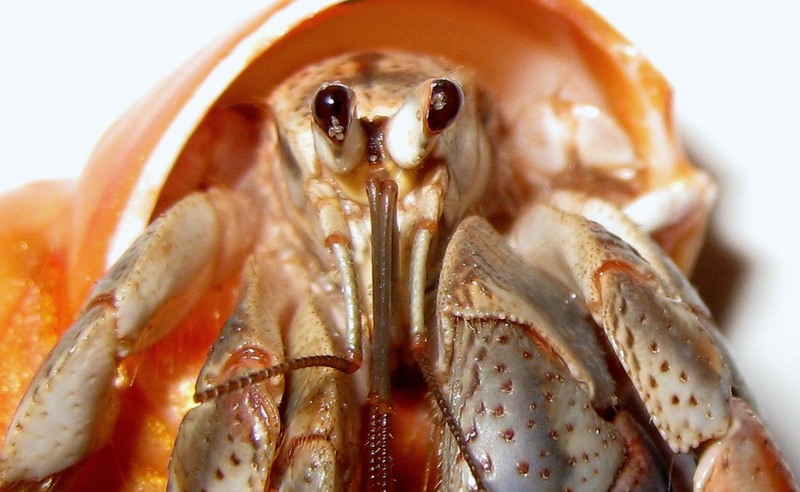 These mites are completely harmless to hermit crabs. 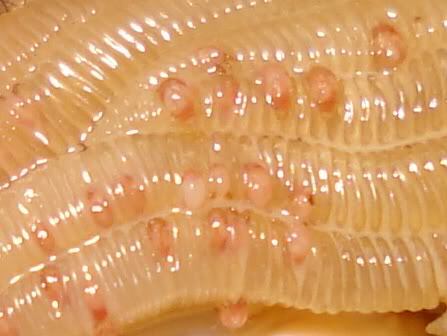 These mites range in color from white to brown, and they move somewhat quickly. They are extremely common all over the world, and they generally keep to themselves and do not swarm unless there is a large food supply available. The predatory mite Hypoaspis miles (also known as Stratiolaelaps scimitus) is included in this order. Gill mites are a new discovery on hermit crabs in captivity, and they usually aren't something you can see unless the crab has died. The gills on a hermit crab are protected by a flap of skin and exoskeleton and they can never be safely seen while the hermit crab is alive. (Trying to do so would kill your hermit crab.) These mites bury into the gills and stay there, probably permanently. It is unknown how common they are, but it's likely that all hermit crabs have at least a few. Gill mites are extremely tiny and are a light pink or red, and are shaped like a tick. It's unlikely that you'll ever see them in motion, but you may find them dead in discarded shells. Because of their location there is no way to treat or remove them. While they are parasitic, they don't seem to cause serious harm to their hosts and they are considered to be symbiotic by researchers. 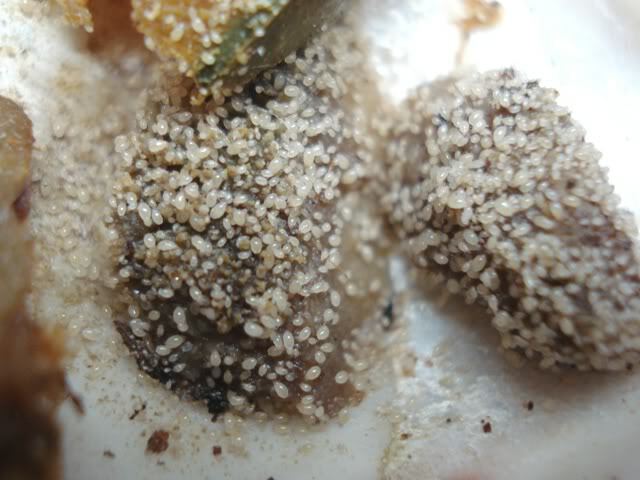 These mites belong to the Ewingia or the Hoogstraalacarus genus. 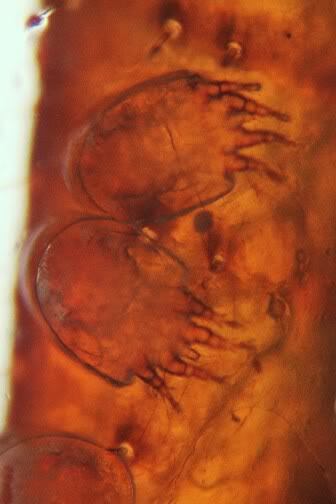 These are mites that are located on the antenna of a hermit crab and no where else. It is extremely likely that these are a phoretic mites that would normally affect native insects but are confused by the exotic crab species they encountered. A phoretic mite is a harmless mite that uses a larger host for free transportation to another area that would have better food sources. In any case, these mites lock in place on the antenna and don't come off easily. Baths won't remove them, and continuing to try can seriously stress out the hermit crab, causing more harm than the mites otherwise would. The good news is that they appear to be relatively harmless and they don't wander around. Several successions of introduced predatory mites may help at least for a while, but there hasn't been any success in getting rid of them. Some crabs are able to scrape them off using their mouth parts, but others don't seem to mind, and do not try to remove them. These are the "bad mites" that you should probably treat as they will spread from crab to crab, and this is the reason why all new crabs should be bathed and inspected before being added to your crabitat. Crab mites can only come from an actual hermit crab, since they would only be able to prey on hermit crabs. 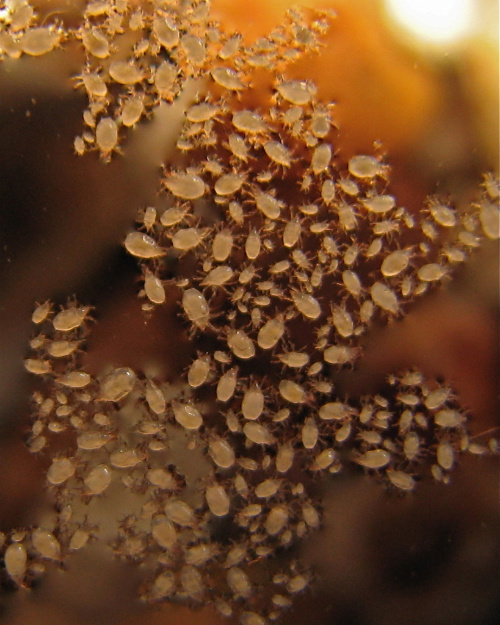 If you've had your hermit crabs for a while without having added any new crabs to your tanks and suddenly discover mites that weren't there before, it's very unlikely that they are hermit crab mites. Not much is known about crab mites and how harmful they actually are. Not many hermit crab owners are willing to wait it out and see what happens since there is that chance that they are harmful or possibly deadly. 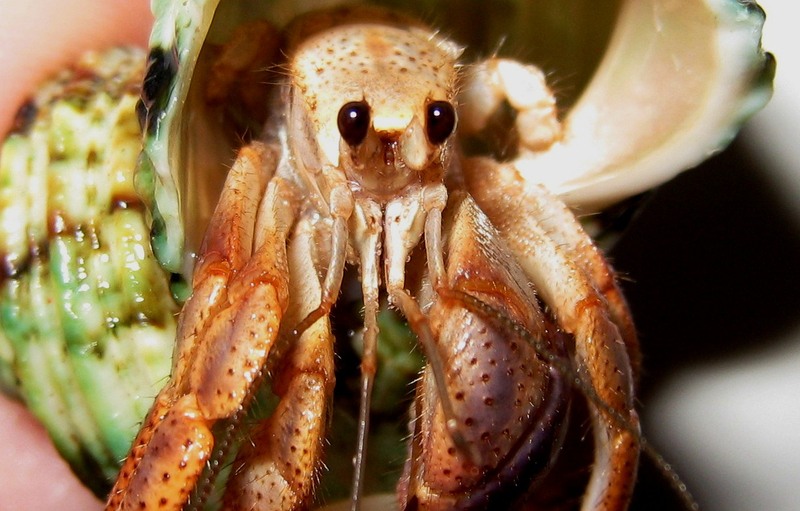 There's a likelihood that they are phoretic (and therefore harmless), but for now it's recommended to treat the crabs to get rid of any mites that are located on the actual hermit crab. One type of hermit crab mites are fast and long legged. They can be seen running around the opening to the shell, or on the hermit crabs themselves. They will often take refuge on the eye stalks or in the joints of the crab, but they won't stay in place for very long. They come in shades of white, cream, grey, and brown. These may actually be Mesostigmata mites, but for now we have no way of knowing for sure. The other type of crab mite is slower moving and more stationary. 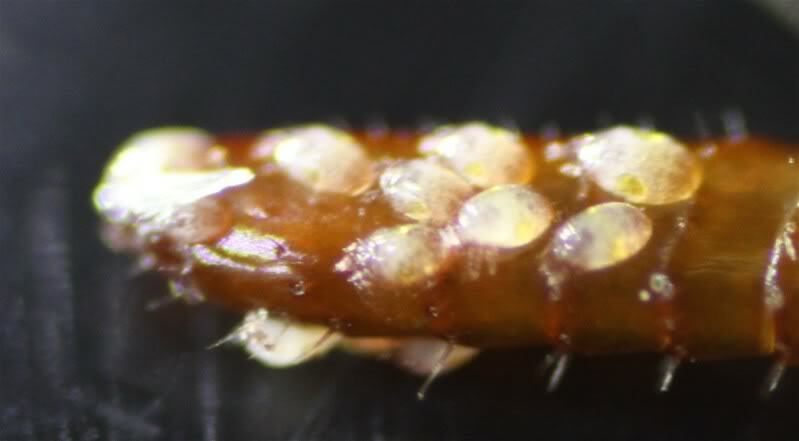 These glue themselves to any soft part of the crab such as the eyes or joints or mouthparts. They are most commonly found on Strawberry hermit crabs, and on other exotics but can infest any species. They are white, cream, grey, pink, or red in color. They don't appear to have long legs and are shaped more like a tick. If a new crab has mites and you have not had him anywhere near your current crabs, then you should set up a bare-bones ISO -plastic hide and paper towels for "substrate" - far away from your current tank so that you can bathe the hermit crab and clean the tank on a daily basis to remove the mites before they spread. Details on Mite Baths is farther down. If your entire tank is infested, then you have two options - sterilize the entire tank and set up your hermits in a bare-bones ISO while you bathe them, or leave the tank and crabs as is and purchase another type of mite that will kill and eat the "bad" crab mites without having to tear the tank apart. That might sounds crazy, but H. miles predatory mites have an excellent success rate of removing all unwanted mites in the tank and on the crabs as long as you have no molting hermits, and once they run out of food they eat each other and the rest die off naturally. Information on how to use predatory mites and where to find them is below. 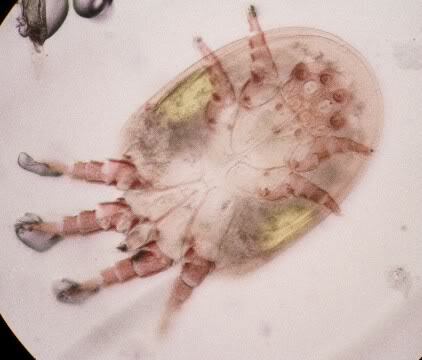 The most common predatory mite used in treating infested tanks/crabs are Hypoaspis miles (also known as Stratiolaelaps scimitus). These mites eat other mites, larvae, and eggs, and generally anything as tiny as themselves. They will not bother your crabs. When their food source ("bad" mites) decreases, so do they. H. miles can be ordered online. However, they are not cheap. It may be worth it if you have a local garden store in your town, to check there, first. Otherwise, try specialty gardening websites as predatory mites are sold to greenhouses to combat problem insects on new plants. It may take several treatments of these mites for them to totally eradicate your problem mites, especially if you have crabs that are underground and molting when you first add the H. miles. Another option is to do regular baths to remove the mites from the crabs. There are different recommended methods of doing this so two variations will be discussed here for both the salt water mix and the frequency. 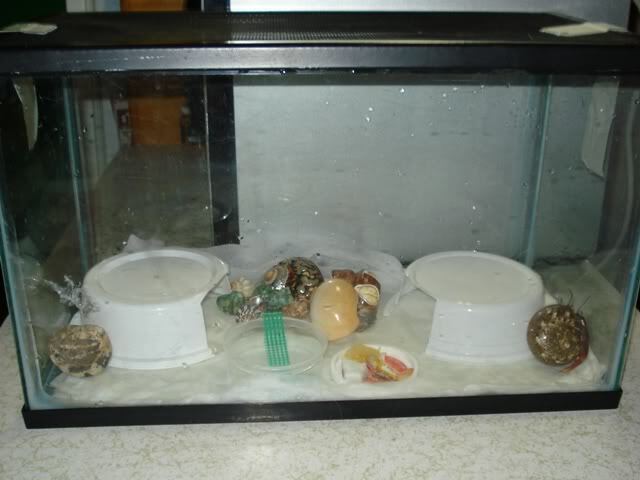 The idea is to keep the hermit crabs is a reasonably sterile environment and clean that environment daily while also bathing the crabs. You continue this process until you are reasonably certain that the mites are no longer on the crabs. The sterile environment is one key component since you don't want to have mites from the environment go back on the crab. Use several layers of paper towels as "substrate" with unbleached paper towels preferred. Provide both salt and fresh water in dishes that are easy to clean. Use food dishes that are easy to clean and replace the food daily. Minimize what is in the tank, but do provide some sort of hide. A plastic container, such as a margarine or cottage cheese container, works well since it is easily cleaned. Turn it upside down and cut an opening in the side to resemble a coconut hut. Humidity is often a problem with no substrate, but several paper towels crumpled into a ball and wet with dechlorinated water both helps with humidity and provides another place for the crabs to hide. Also provide a few empty shells. Everything in the tank should be removed and cleaned daily while the crabs are out for baths. Also wipe down the inside of the tank with dechlorinated water while everything is out. Marine salt water, like what is used to mix your salt water should be used. Common brands are Instant Ocean or Oceanic. The mites don't like the ocean salt so they tend to come off the crab. There are two thoughts on the strength of the salt water. Some people advise to use double strength salt water and others recommend regular strength salt water. The thought behind double strength is that it is more detrimental to the mites so they are more likely to come off the crab. The thought behind regular strength is that the crabs aren't used to stronger salt water so it could be harmful to the crab as well as the mite. The decision on which strength to use is up the each person. To bathe the crabs you need two bowls, one with salt water and one with dechlorinated water, both the same temperature that they would be in a crabitat. The water should be deep enough so that when you put the crab in the water, shell opening up, they are fully submerged. You want the mites to float off the crab and on to the surface. Place the crab into the water. Most will turn over on their own and when they turn over air comes out of the shell and water goes in, often rinsing the mites away from the crab. If the crab doesn't turn over on its own after a minute turn them over. Once the crab turns over (or you turn it over) hold the shell by the sides and gentle move the crab back and forth in the water. This comes close to replicating the motion that crabs use under water to rinse out their shells. After anther minute, or sooner if the crabs appears frantic to be out of the water, move them to the bowl of dechlorinated water for a quick rinse. The goal is to neutralize the salt water with some dechlorinated water. The reason its is key that you provide both salt water and dechlorinated water in their tank is so that they can then adjust their shell water correctly. The water for the baths should be changed between each crab so that any mites or eggs aren't transferred from the water to another crab. Check the water bowls after each crab to determine if any mites are coming off of them. The frequency of the baths is another topic where there are different opinions. Some advise doing baths three times a day; others advise doing one a day. More obviously helps remove the mites faster, but it is also very time consuming and is more stressful on the crabs. It is up to each person to decide what both they and their crabs can tolerate. You should continue doing baths until you see no more mites. 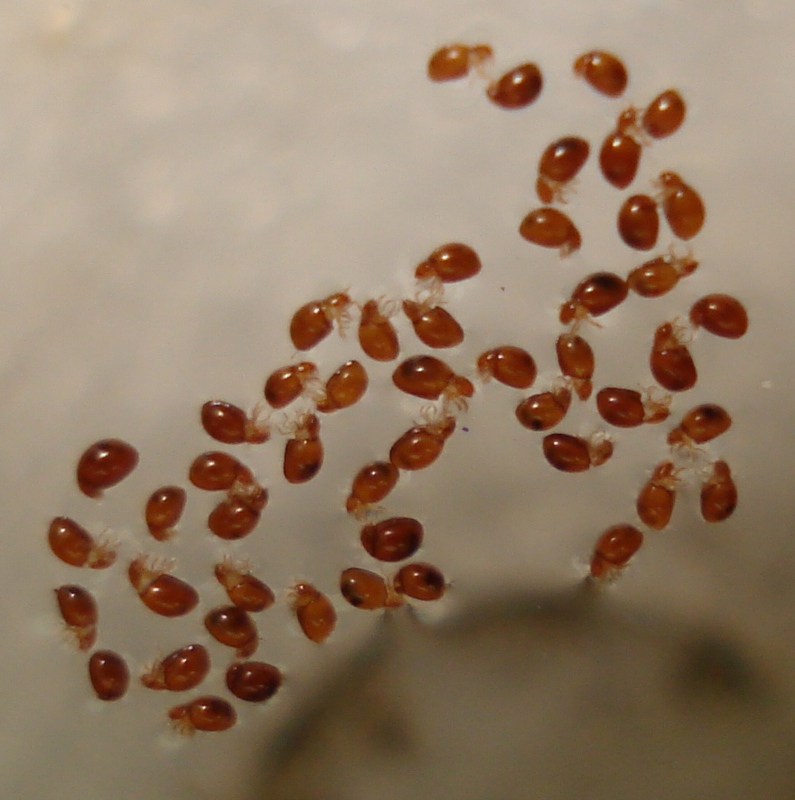 The incubation period for the mite eggs is 3 days, so you will want to continue to leave them in the sterile environment for at least 3 days beyond when you see the last mite, then bath them at least once or twice more to get rid of any newly hatched babies. Of course, if you see babies, then you would want to again wait the 3 days. In addition to the baths, if any crabs changes shells you should immediately remove the old shell and rinse it in water to see if you find any mites. The mites will often be found in the old shell.